Over time, consumers have grown and shared their email address with more businesses. As a result, users are being sent dozens of promotional newsletters every single day. Emails with sales pitch after sales pitch, after sales pitch. It’s easy to understand why consumers have stepped back and decided to stop opening these emails as frequently. The consumer provides email to your business. The consumer offers this same email to Facebook during registration. You upload your list of emails and cross reference it with Facebook’s database to build a custom audience. Make sense? This is awesome! 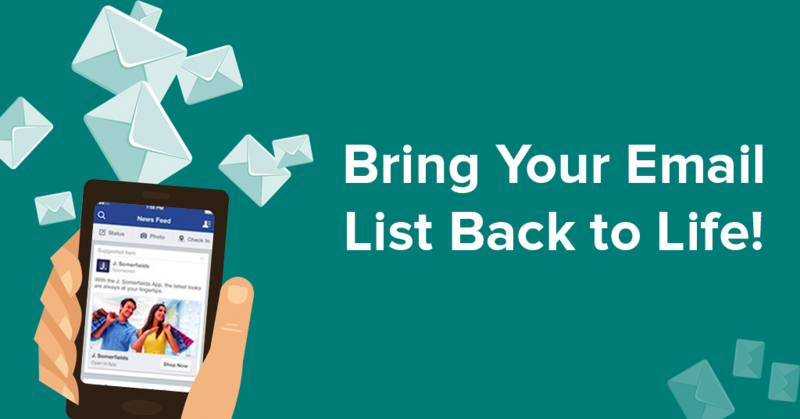 You can now earn the attention back from the users on your email list. As a rule of thumb, we usually see an 80% match rate. This means if we upload an email list of 1,000 consumers, we can target 800 of them. The Help Center on Facebook has a step-by-step guide on how to upload your email list. In addition to advertising to your email list of current customers, you can also create a Lookalike Audience. When you create a Lookalike Audience, Facebook will find new users who look like the current customers on your email list. In return, you’ll be able to reach a new market of people who have similar traits to your customers. You can learn more about Lookalike Audiences here.